After three years of development, final testing of our new DOMINATOR HIGH-HELIX stainless steel impeller is being completed. 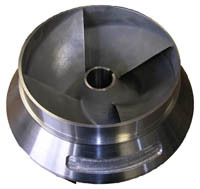 This new impeller is also made from 17-4PH stainless, the high helix allows the impeller to take a really big bite of water. Initial test have been fantastic.